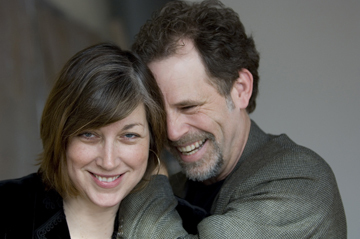 Now officially retired from music, Neal and Leandra toured the country as a duo for more than twenty years with their laid back, easy going folk style that has earned them a loyal following. Their journey as musicians was a happy accident that led them to a career as one of the most respected folk duos in acoustic music. Graduates of Gustavus Adolphus College in Minnesota, the two were on a completely different path. Leandra went off to graduate school for Spanish and Neal received a Masters in divinity. On his way to medical school and a lucrative career in international buisness, Neal dropped those plans and decided to hit the road as a musician with a handful of songs he had written. Somehow convincing Leandra to join him on tour, the two were well-received in the coffeehouses they played. The simplicity and directness of their songs is disarming and elegant. The songs are layered with textures of everyday life and love. They have recorded eight albums indcluding four Red House releases: Hearts and Hammers (1994), Old Love (1995), Accidental Dreams (1996), and Stranger To My Kin (1998).